Happy Monday folks! If you caught Friday’s newsletter (subscribe here! ), you’ll know I was considering starting Kayla Itsine’s BBG workout. I’m doing it! I purchased the digital guide over the weekend (it’s cheaper than the App! ), and am starting today. If you’re interested in learning more or want to get inspired, head to Instagram and check out the photos in the #BBGCommunity hashtag. Here you’ll find the incredible, real-life transformations of millions of women who’ve used Kayla’s program – it’s what made me want to join! Wish me luck… If any of you have tried BBG, let me know! Would love to hear your thoughts and any tips you might have for sticking with the program! Now onto today’s outfit. 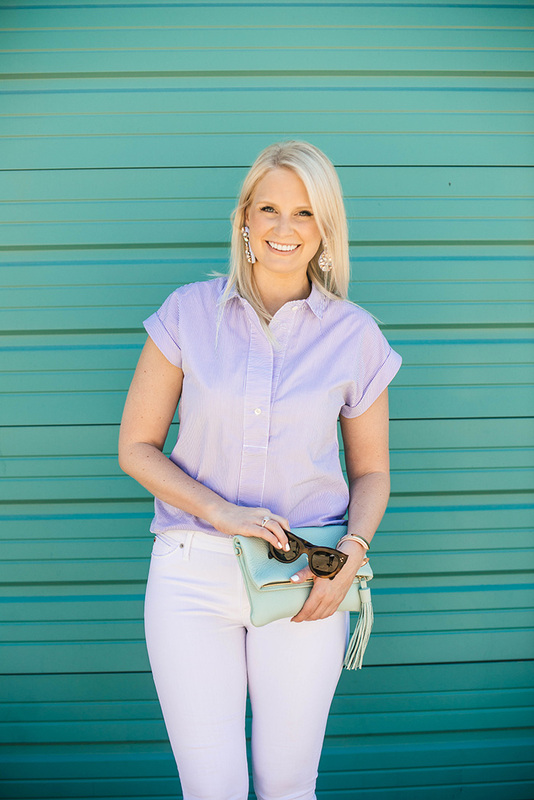 I’ve been eyeing J.Crew’s popover top for the past year (it’s become a classic style! ), but finally pulled the trigger while I was at the store a couple weeks ago. It’s such a pretty, polished piece, don’t you think? I saw it is now available in three solid shades (I could really use the white! ), and am considering picking it up in another color. 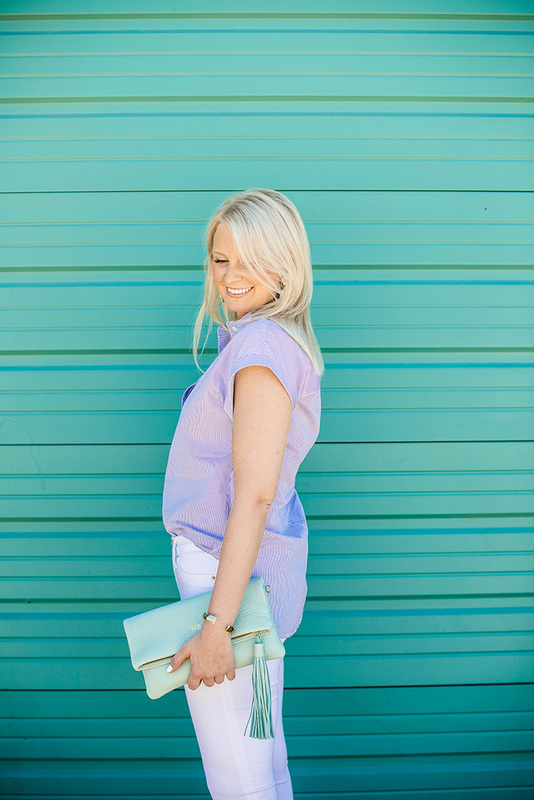 It’s just such a versatile piece – appropriate for work, but looks just as great with your favorite pair of jeans. Another piece I couldn’t check out without is this pair of earrings. 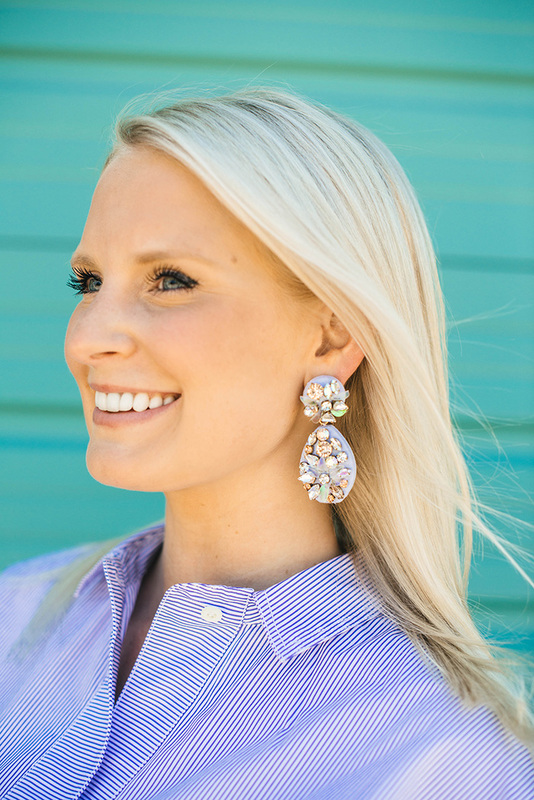 J.Crew has the BEST statement earrings – if you’ve never seen them before, do yourself a favor and hop on over to the site. 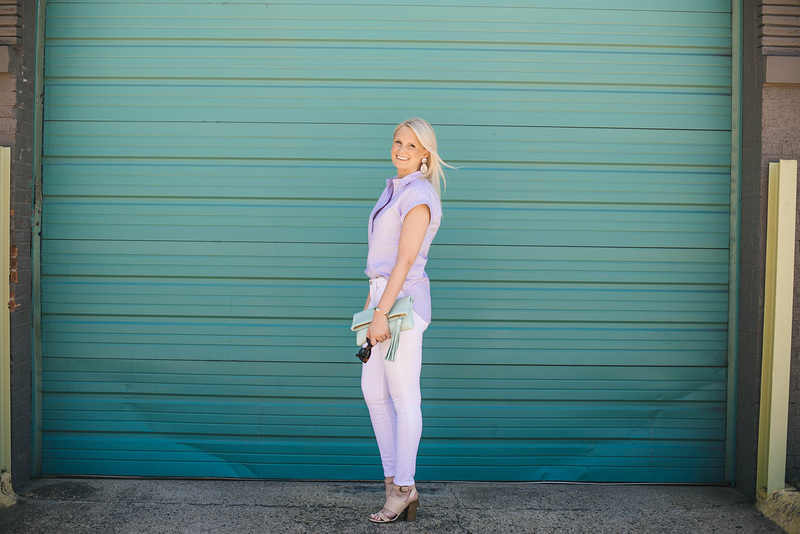 They are all under $100 and in so many fabulous spring/summer styles! A few favorites right now include these beaded tassels, these crystal cluster earrings (reminiscent of a bug, am I right? ), and these pink + red chandeliers. I’ve done BBG1 and BBG2 and started over it is such a cheaper alternative and it will make you so strong. I’m starting BBG1 today too! Will you post updates on your progress? Gorgeous!! Love this look! So fresh and crisp! Yay! I am starting week 3. Loving it so far. Love this top, looks like something I’d wear all the time! Good luck with the BBG, I’ve done a few of the workouts and they’re great! Love this ensemble. Also, not sure about the BBG but I’ve been working out, I like to cycle so I do that most days with a mix of strength training. 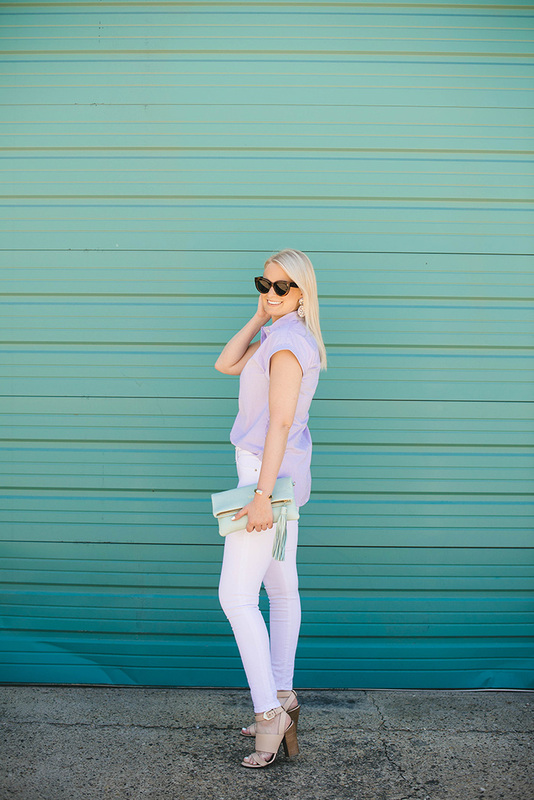 Love that top with your white jeans! The close up shot of you is gorgeous. Such pretty earrings too. Good luck with the new workout! I love the top so much! you look great. I’d never heard of BBG until I came across another blogger posting about it today. I’ll have to check it out. Love this outfit. 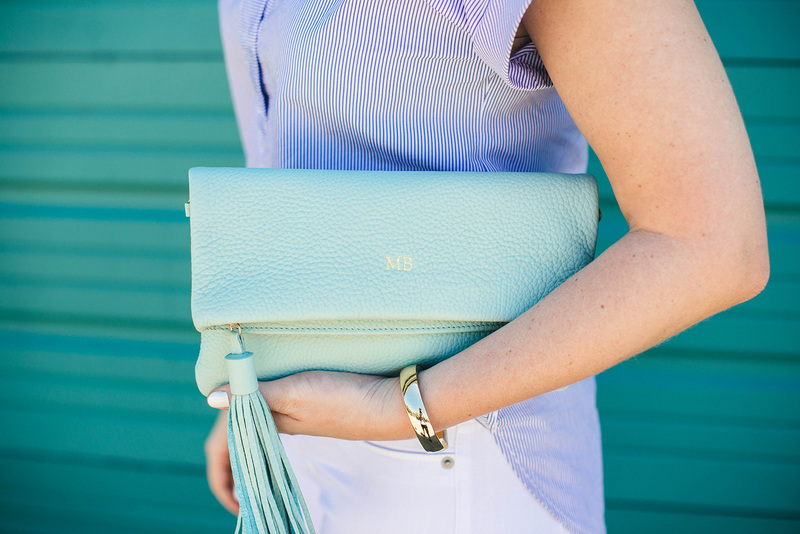 The clutch works so well with the top – so effortless. Great look. you look so pretty! <3 I love the location you picked to shoot. The colors look amazing.